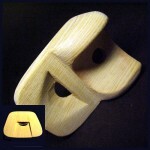 Like the Jew’s harp, check this elegant little pocket instrument came from Adaptatrap Percussion in Brighton. You press the curved mask against your nose, erectile shape your lips into an O around the bottom shape and exhale nasally. If you cup your tong right, you get a round, easily dopplered note like that of a slide-whistle. I wish I’d bought more of these at the time for gifts. Such fun.